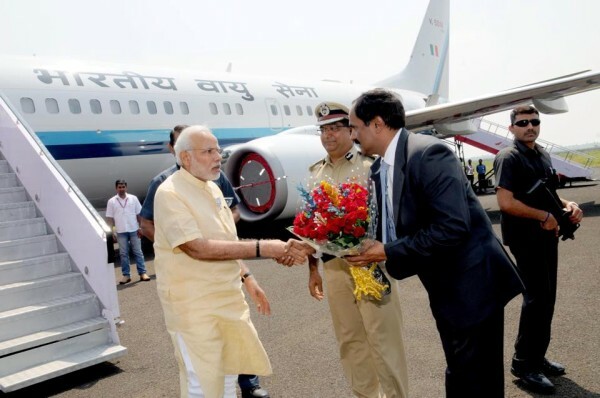 Prime Minister Narendra Modi made a brief halt at Sambra airport while he was en-route to Tasgaon in Maharsahtra for his campaign rally. He arrived here in a special flight amidst tight security. This was Modi’s first visit after being elected as the PM. There was security even at the gate of the Airport. DC N Jayram, Commissioner of Police Bhaskar Rao and BJP MP’s were present to welcome him. He flew to Tasgaon in a helicopter later. Modiji aap Jo bhi sochte Hai usame sabka bhalai Hai aap KO bhagavan aur jyada shakti de. Vittal.B.Hatti’s All family members. Iam also from belgaum and i know that only smaller aircraft like atr n bombardier q 400 can land in belgaum airport then how our pm’s big jet landed in belgaum airport? Plz some one tell me which is this jet? At Belgaum airport no cameras are allowed. Just for your info. How was this picture permitted.